Hmmmmm … Well, I can tell you that excitement of mine didn’t last too long. Okay, here it is: this was average. So I’m having a very difficult time forming the words to adequately summarize the issue. I reiterate—it’s average, and you know, that’s kind of a big problem you don’t want to have when you’re pitching yourself and your entire line of comics very hard to those elusive new readers. What this should have been was MIND-BLOWINGLY EXCELLENT. This should have kicked things off with a bang, knocked me out of my chair, and had me smiling like a Cheshire cat for the rest of the day. But instead I’m … I’m just kind of … confused. Let’s start with the great: the artwork. I am a complete and utter sucker for pretty much anything Jim Lee does, so having him draw this book is a sweet, delicious treat for my superhero-hungry eyeballs. While I wonder about his ability to produce on a monthly deadline, I will bow to the fact that he delivers here. I know he’s not everyone’s cup of tea, but this is only 24 pages of Jim Lee goodness, and I’m all over it. If I were a smoker, I’d need a puff after staring at the panels in this book. The final page … oh my God, yes. I want THAT. You go, Jim Lee! Now, unfortunately, the not-so-great: the story. You know, only the second most important thing in a comic. I have not read very much Geoff Johns in my time—I skipped over all that Blackest Night, Brightest Day hoo-ha, so I don’t have a lot to compare this to in terms of his varying levels of talent. I can only go by what I have in front of me, and what I have here is average. It’s not necessarily that the story is even that bad. I just question the route taken here as far as using the first issue to “form” the Justice League. The story opens up with Batman chasing/being chased by minions of Apokolips. That’s all well and good, until Batman starts firing some weird missile/projectile weapons from his arms. I know, right? What is that about? We all know Batman doesn’t use guns, and although these are technically not handguns, the page spread certainly brings them to mind. I’m going on a tangent, but it’s just kind of a weird scene, and it honestly got me off on the wrong foot right away. 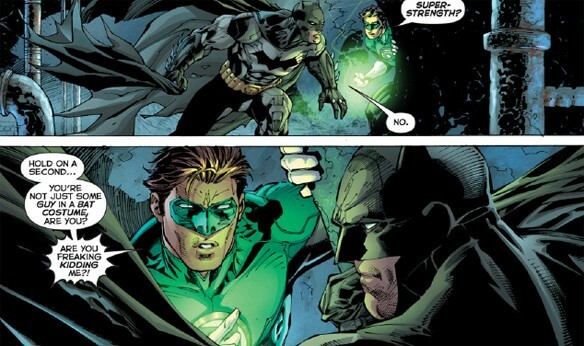 Batman eventually meets Green Lantern (Hal Jordan), and the two verbally spar as they flee the oncoming authorities … or whatever. This is five years in the past, you see—a time when vigilante superheroes are not so adored by the public. We also transition to a couple of separate scenes featuring Vic tor Stone, but frankly, I have no love for Cyborg, so he’s completely unimportant to me. I’m actually a little peeved that he’s even being set up as a “founder” now. The reason I wonder why Johns has chosen to tell this story immediately is because, let’s face it—this issue is the Batman/GL show. That’s entirely all it is. And while that may be fine for readers like ourselves who know these characters and this history, think about the new reader coming off “the street.” If this is meant to be accessible to them—if I’m not a comics reader and I decide to wander into a comic shop looking for Justice League #1 because I saw it advertised somewhere and I’m intrigued by this cool-looking cast of characters—how am I going to feel when I pick up that first issue expecting to see a team and not getting one? How am I going to feel expecting to see Flash or Wonder Woman and not getting either one? Seasoned comics fans know how misleading covers can be. Newbies don’t. So, to me, the way this could have been remedied would have been to open up the first issue with the team already established—maybe they’re fighting some giant dude or whatever, I don’t know—and they’re quipping with each other back and forth, and Batman is his usual brooding but badass self, and Flash is cracking jokes left and right, Superman is eye-beaming something to smithereens, and Wonder Woman’s punching a dude through a wall. Wouldn’t the action taken here and the dialogue provide the perfect vehicle to demonstrate to you exactly who these people are and how they get along? Meanwhile, if you so choose—or perhaps you can leave this for the next arc—you can have “flashback” scenes showing all these important first meetings and the formulation of the team. The best way to learn about these characters and their relationships is to actually see them in action. It’s all about show, don’t tell. Johns didn’t need to give us the step-by-step in order for us to get it. Heck, we could have understood this team without ever seeing them come together at all, and to me, that would have been so much more interesting to just piecemeal it on my own by watching them. So, it’s not that this was all bad—just that it was average storytelling. Is that really the best that Geoff Johns has? kind of remind you of this? Why, look at that. 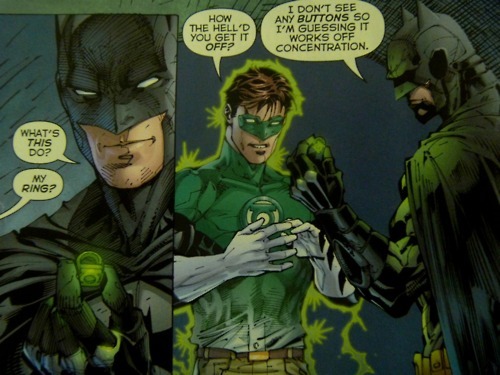 Green Lantern gets his RING stolen … TWICE?! Yeahbuhwhaaa?!?! The first photos in each set are from this week’s issue of Justice League. The second photos in each set are courtesy of Frank Miller’s All-Star Batman & Robin from just a few years ago. It’s déjà vu all over again, and I’m afraid you’re going to have to do much better than this to keep my interest, DC. I suppose I should expect Superman’s first meeting with Wonder Woman to be a ridiculous fight that ends with an even more ridiculous kiss, based on what we’re going for here. I mean … that’s what happened in All-Star, isn’t it? By the way, I bought the standard shelf issue of this comic book, as I will with any other. The polybagged combo pack with downloadable copy just isn’t for me. I have a huge stigma against the idea of digital comics, but that’s a post for another day. 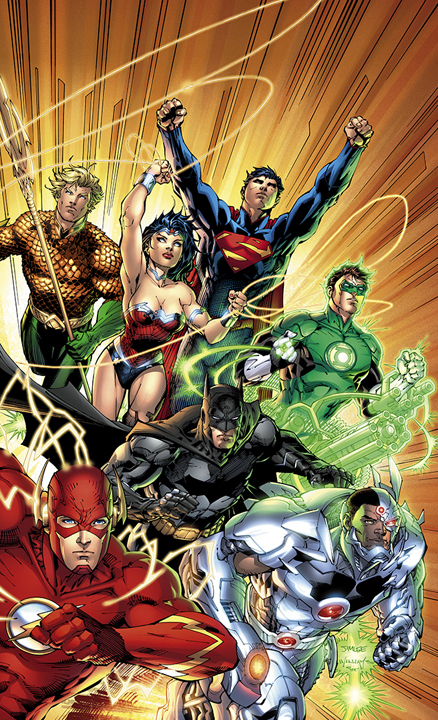 Ultimately, Justice League #1 was an okay read, but it didn’t blast through any ceilings. Here’s hoping the following 51 offer something better. This entry was posted on 09/04/2011 by ravenhaired. It was filed under Comic books, Reviews, What I'm Reading / Wednesday New Comics and was tagged with DC, DC Reboot, Geoff Johns, Jim Lee, Justice League, New 52. 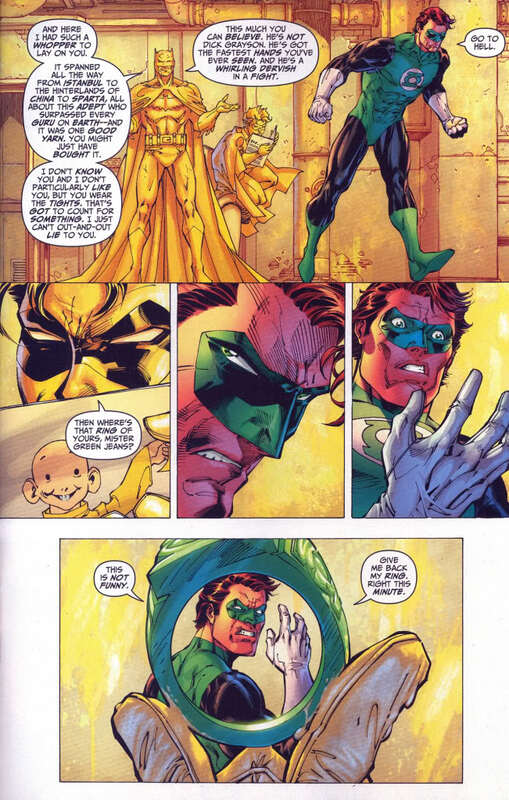 I read the issue of Justice League and was totally turned off by the way they portrayed Hal. 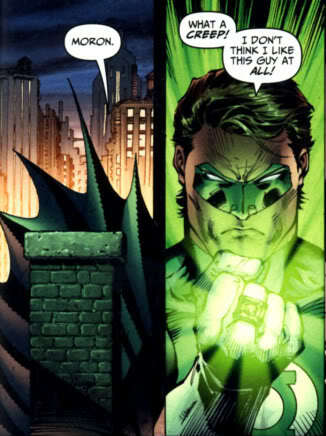 Who are you and what did you do with Hal Jordan? Going back to the first issues of Green Lantern, I found him to be thoughtful, conscientous, and intelligent. He was also worried about the possibility of losing the ring in space or on other planets right off the bat, and programmed it not to leave his finger. He used it to ananlyse situations and energyies first before trying to change them and despite recent snide remarks, has used some eclectic ring creations to defeat foes (making chemical compounds for instance when direct force did not work.. It is rediculous (and against previous continuity which of course we can’t use) that the guardains would not know about, and equip the ring with knowledge of the New Gods. Or Kryptonians for that matter, if GL even bothered to find out what kind of alien he waw dealing with, witch as I said was totally out of character. Fianlly, I found Superman’s behavior discraceful. 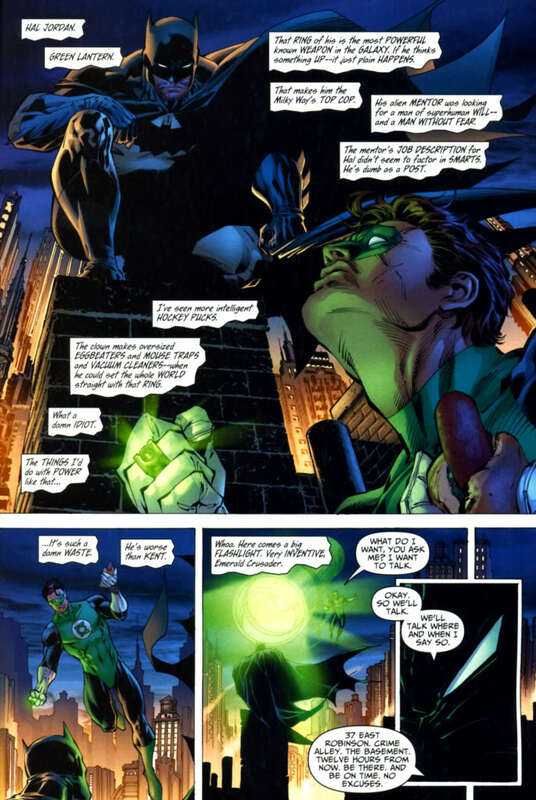 His attack and assault and battery of Green Lantern was extreem, and unjustified. On rereading it, I guess there was some logic since GL said he would “resrain” Supes,but even so, His response was out of proportion. 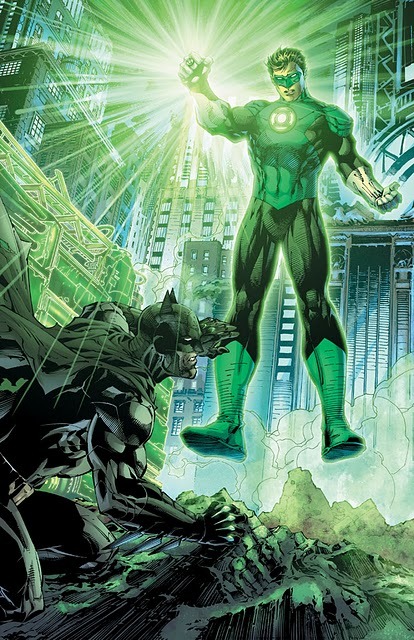 GL should be watching his chance to place him in a Kryptonite cage (when he gets around to asking his ring, sigh,) and bringing him to OA for imprisonment in a sience cell for abusing his powers.